The Base is held by the chucking lug and indicated both radially and axially. The base was faced just enough to clean it up and the extra lug cut off flush. 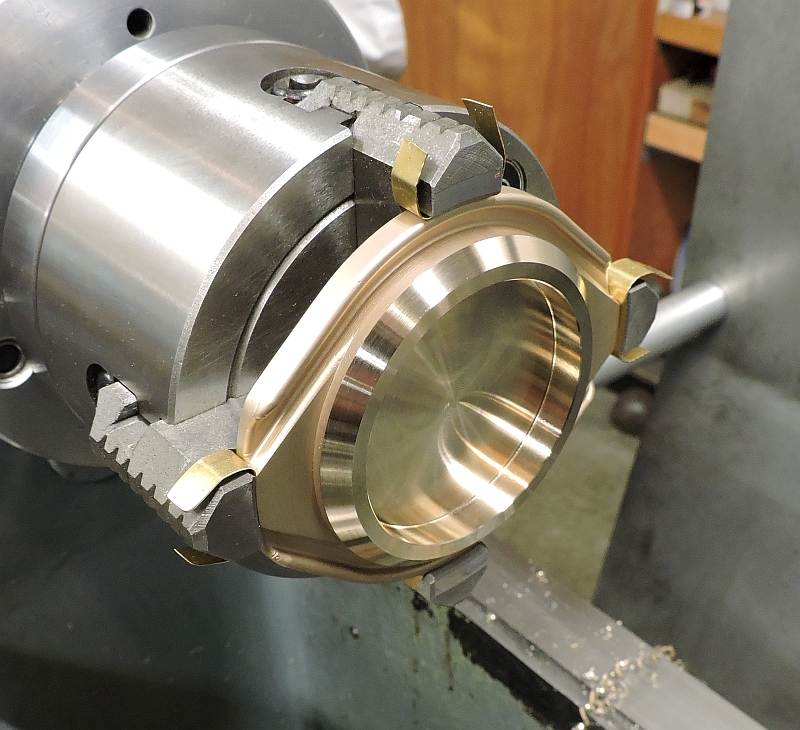 The remainder of the lug was machined into the raised boss seen in the later photos. If you look closely you can see a small raised boss where the indicator point is on the outside edge. 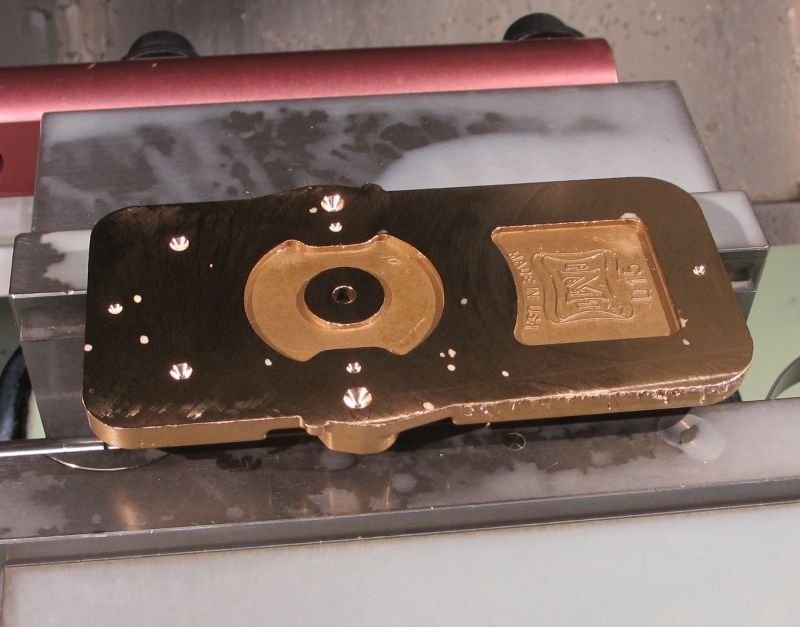 I machined the periphery of the base to just remove this boss. Personal preference but I think it looks more like the original with the boss removed. The base was flipped around and indicated in. 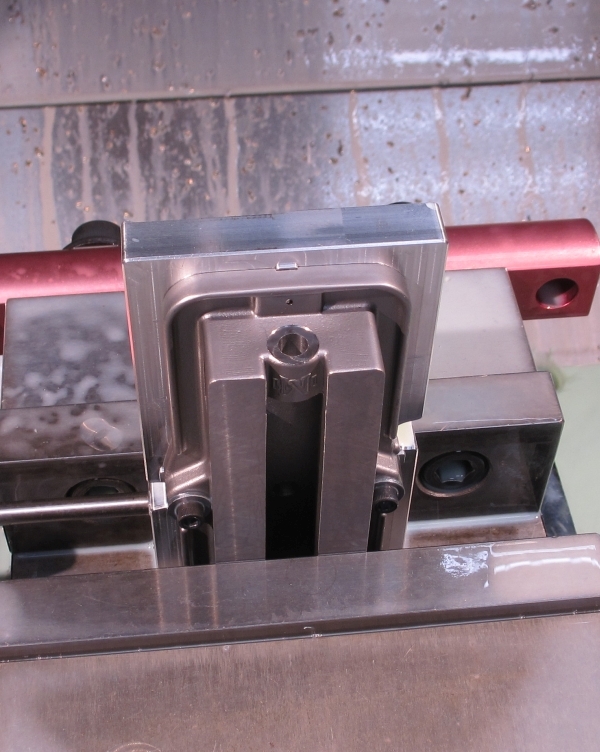 The chucking lug was carefully machined away and the cavity machined using a boring bar. 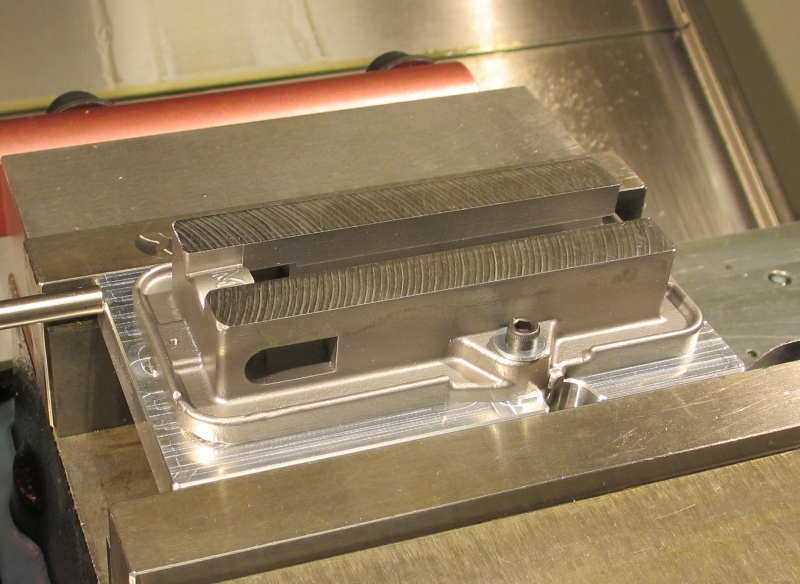 The base was also faced to proper thickness and the bevel for the numbers machined. The Swivel Pin hole was also drilled and reamed for a press fit on the pin. At this point the groove for ½ of the Swivel Bolt key way could have been added, but my plan was to do it in the mill using a key seat cutter. 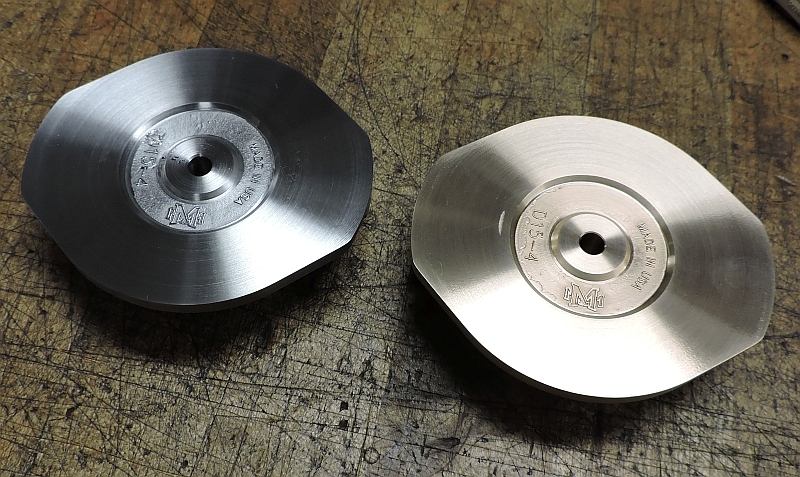 Here are a couple pictures of the two Swivel Bases with the lathe work completed. Note; I took a very light facing cut across the surface where the mounting bolts go, just to level the surface. It was then bead blasted so it is not real obvious. 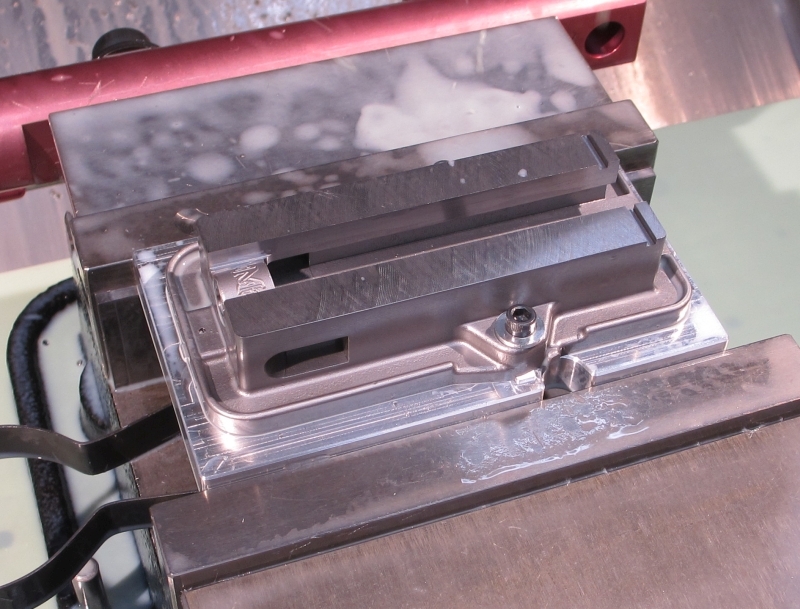 A pair of soft jaws were machined to hold the swivel base for the next two operations. Mounted upside down and using the swivel pin hole as my datum. The key ways, key retainer screw holes, bolt clearance holes, and swivel center mounting holes were all added. Here is a picture of the features listed above. 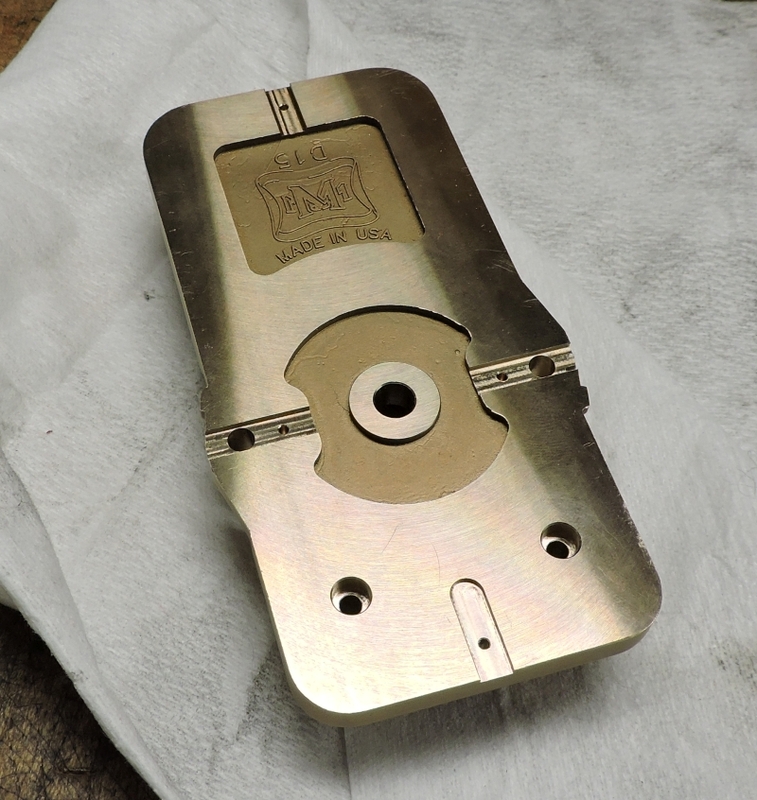 The with the swivel base flipped over and dialed back in the Swivel Bolt key way was machined using a key seat cutter. 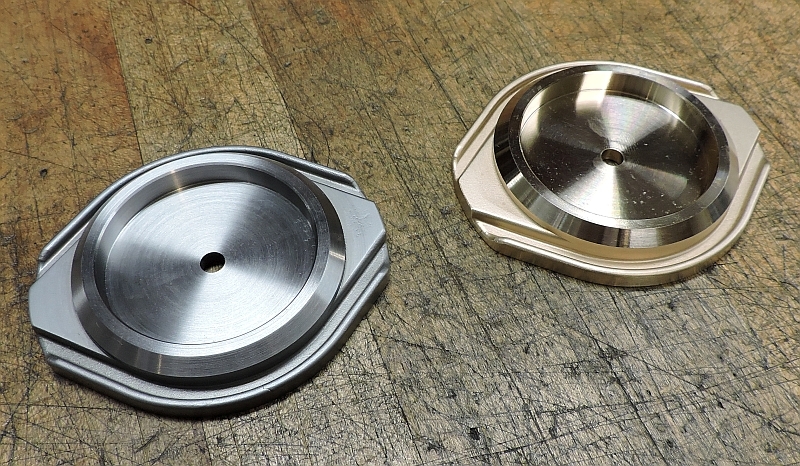 One half of the keyway is in the base and the other half is in the removable Swivel Center. 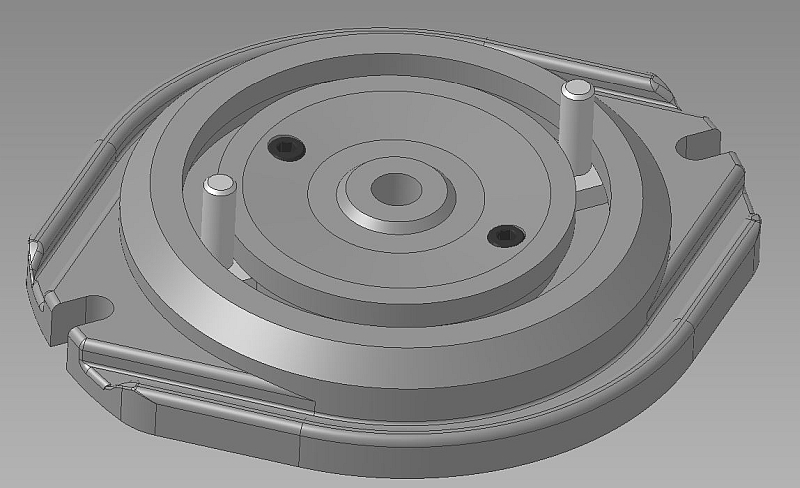 Here is a screen shot that shows the how the swivel center mounts and forms the rest of the key way for the swivel bolts. That’s all for now, thanks for checking in. Those look just perfect Dave. You got a lot done!! 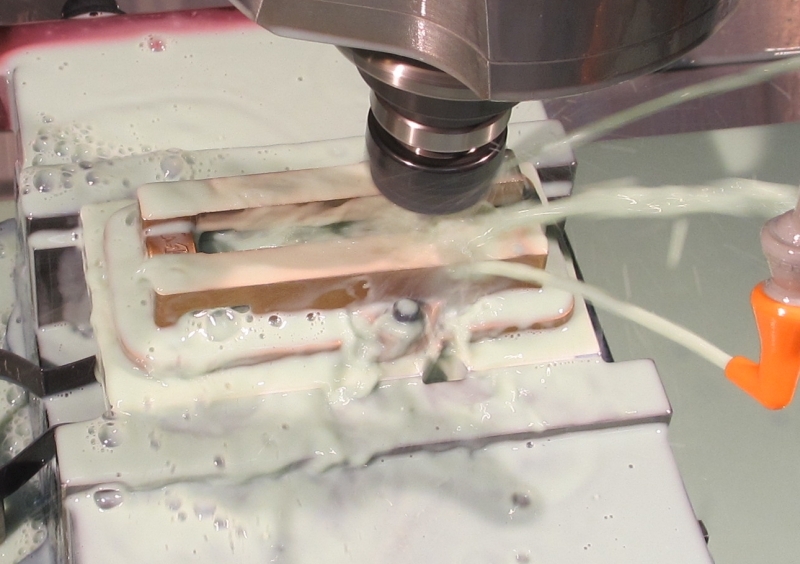 Dave, are you using CNC for cutting the key slot in the base? I might use the lathe for that cut. Dan, yes I did use the CNC for the secondary operations on the Swivel Base. Thanks for checking in guys. Work continues on the vises. 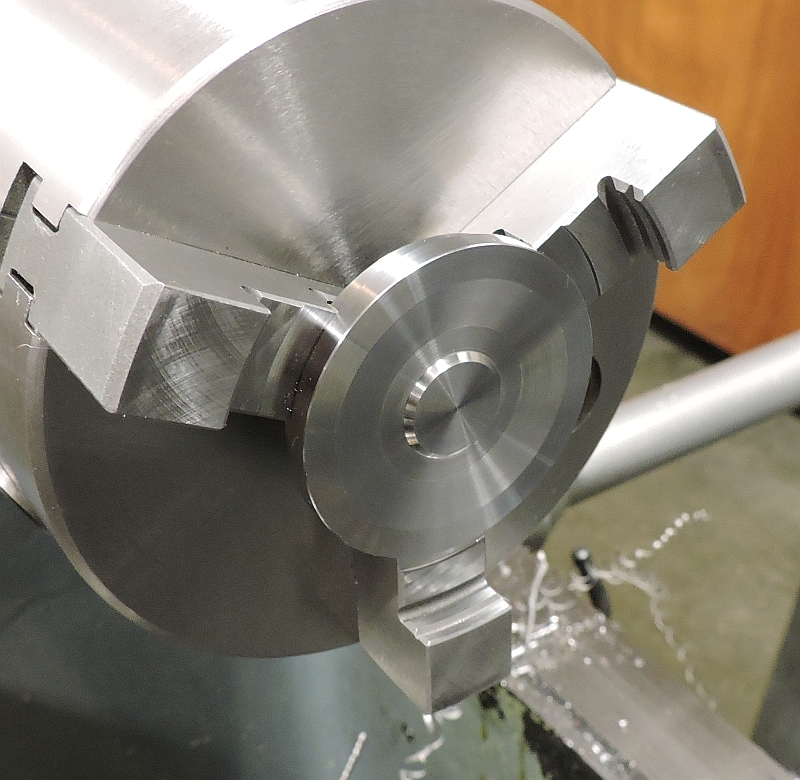 The Swivel Center started out as a slice of 12L14 steel. Chucked up faced and turned to proper diameter; the relief for the Swivel Bolts was also added and the center hole drilled and reamed. 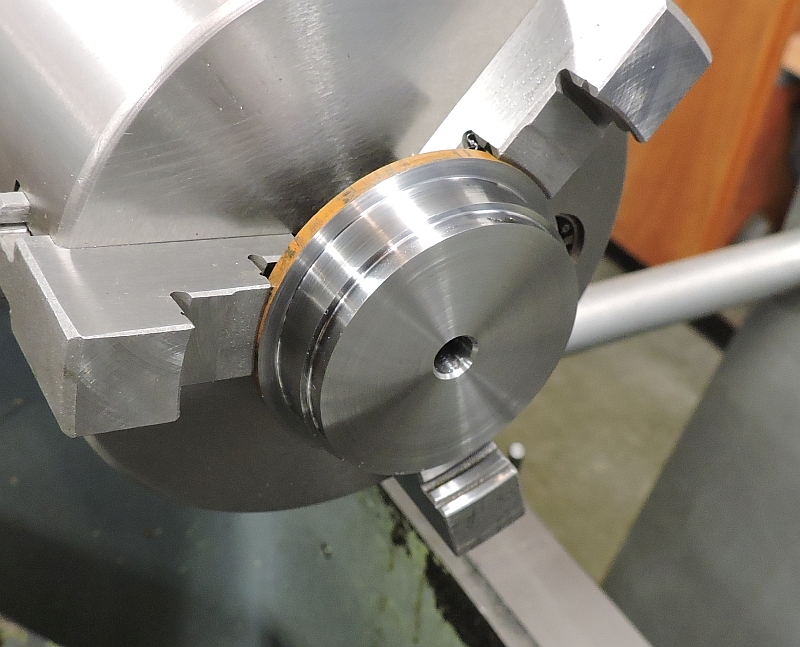 This is a slip fit over the center pin which is pressed into the Swivel Base. Flipped around, the top is faced to thickness and the detail added. 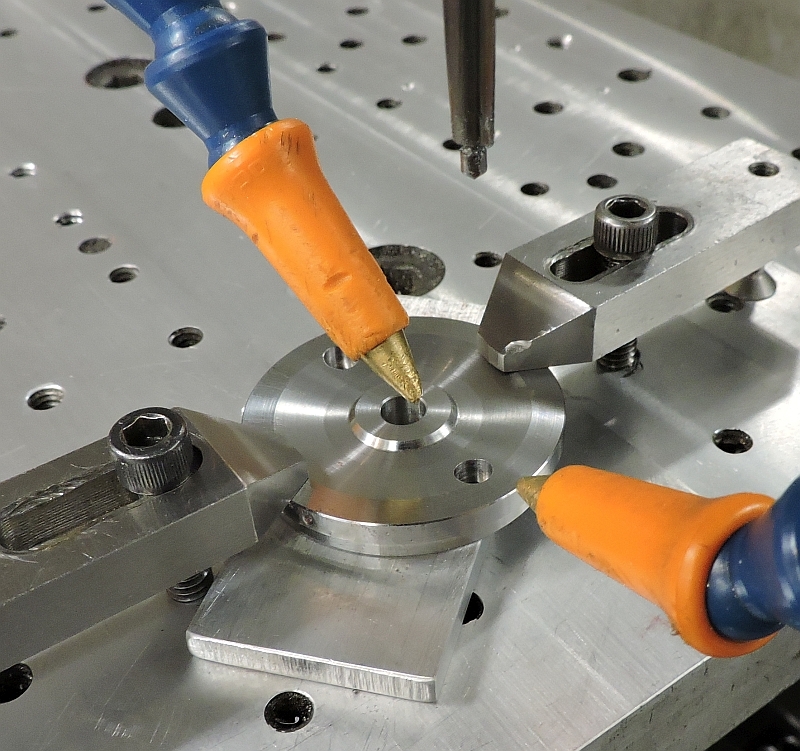 Set up on a fixture plate in the mill, the mounting holes are drilled and counter bored. 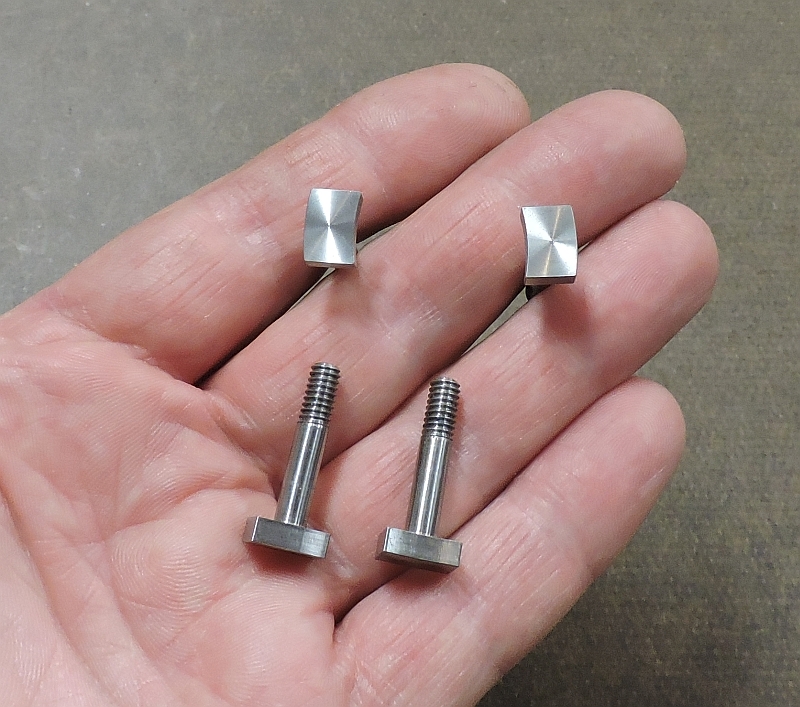 I didn’t take any in process pictures of the Swivel Bolts; here is a shot of the completed bolts. Notice the curves that match the circular channel in the Swivel Base assembly. 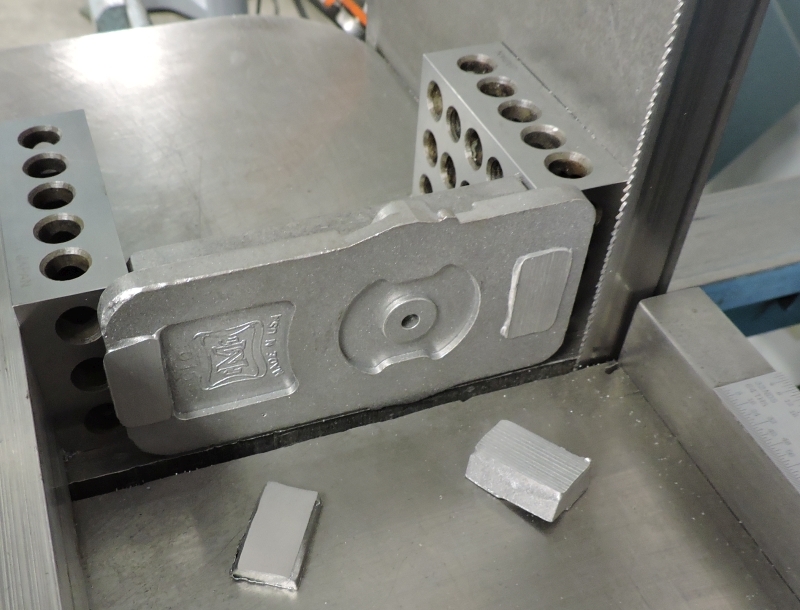 The ends of the bolts were machined using the CNC. 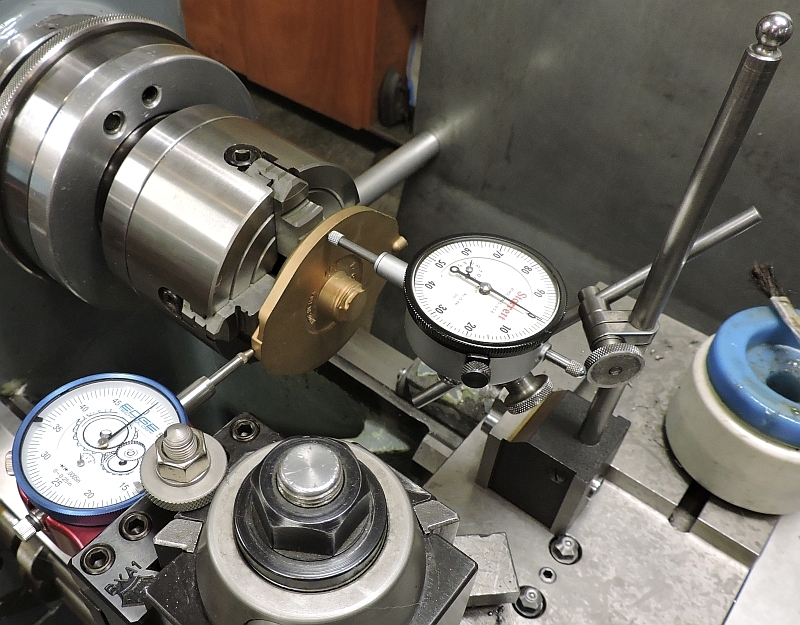 I had left them oversized from the lathe, mounted them in a collet and cut the profile. Here are the assembled Swivel Bases. Starting on the Body castings, the extra material left from the foundry was carefully removed in the band saw. Here is the Body with the underside machine work completed except for deburring. The Bodies came out pretty good, but after doing these Roland and I had some discussion about the best way to insure the bottom features are aligned with the rails and boss for the screw. Roland came up with a better order of operations to insure this, and has made these instructions available along with the plans. It’s good to see the Body fitting the Swivel base so nicely. Notice the little bump where the index line will be engraved, there is one on each side. 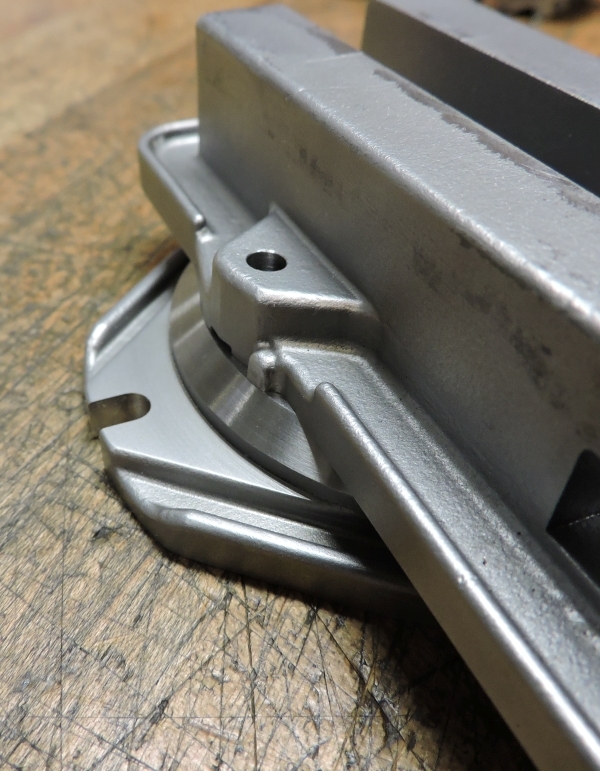 These bumps were machined at the same time as the rest of features on the bottom of the Body and are machined to the same radius as the upper surface of the Swivel Base. 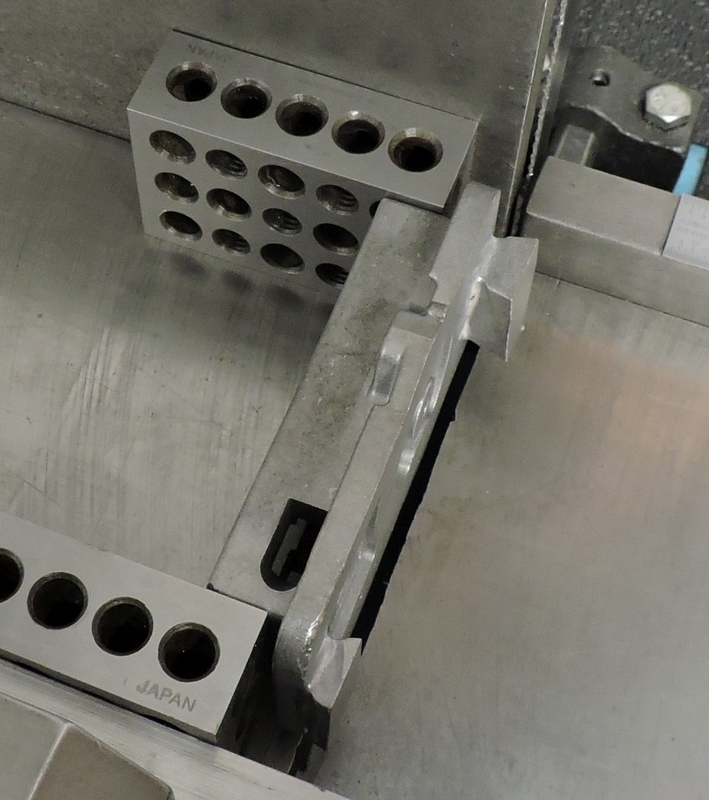 A simple fixture was designed and machined to hold the Body for the rest of the machine work. The fixture has keys that engage the key slots on the bottom of the Body. 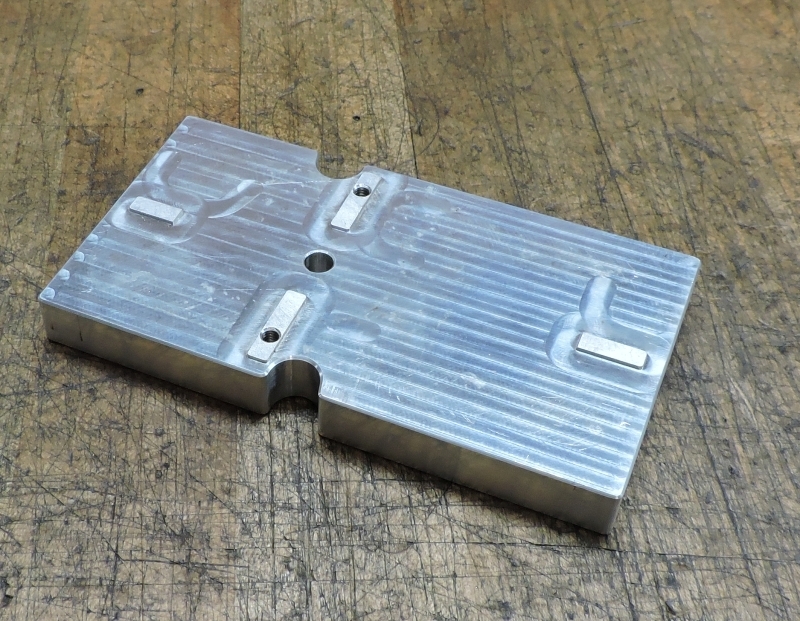 It holds the body square and parallel and includes a center hole for indicating. The cut outs on the sides are for work on the index lines and the little bumps where they reside. The Body was mounted on the fixture and faced to thickness. Standing the Body and fixture up on end, the hole for the screw was drilled. The surface for the Collar was also spot faced to clean up the cast surface. By using the fixture I knew were my center line was and didn’t have to mess around with indicating a pin through the center pivot hole. The Body and fixture were set back down and indicated using a gauge pain and coax indicator. 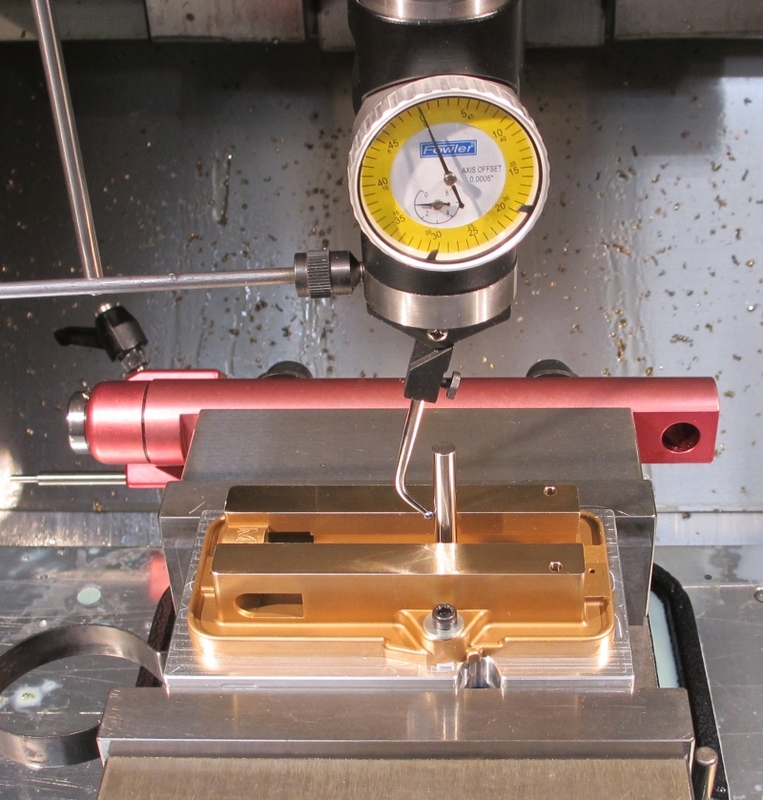 Some machining fun! 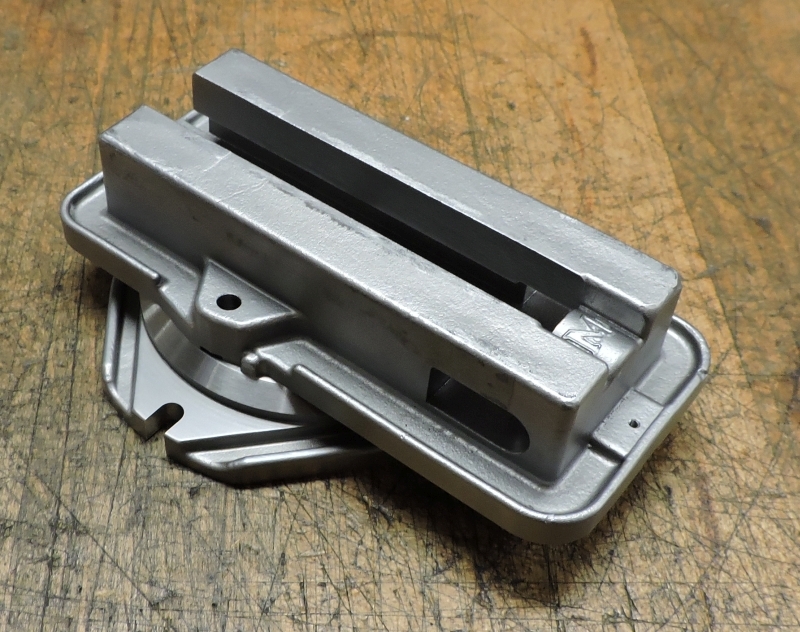 The inside of the rails were machined, this used two different cutters, a 3/16” end mill was used for the full depth cuts then a 1/6” end mill was used to go back and nibble the area on each side of the screw boss until it just blended with the other surface. 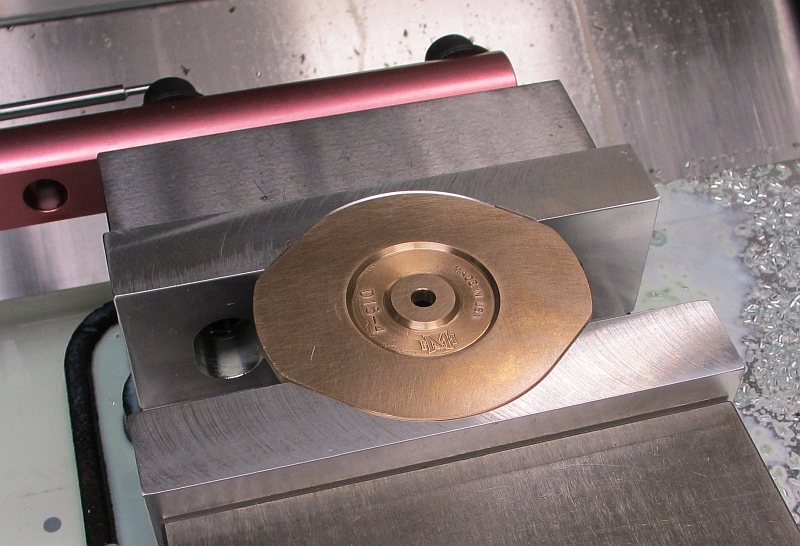 Then a key seat cutter was used to machine the cuts under the rails where the nut will bear. 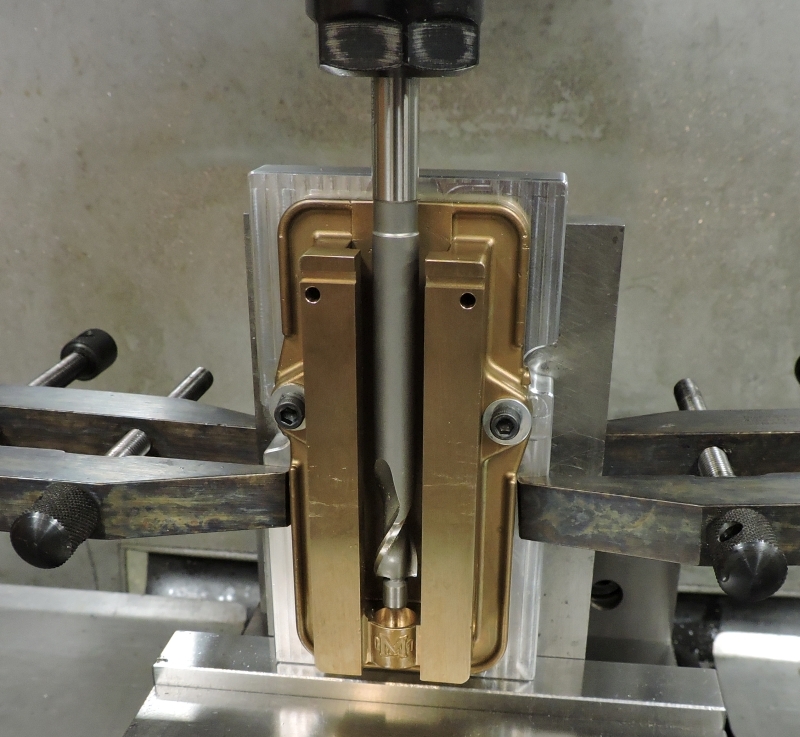 The key way for the Stationary jaw was also machined in this set up. 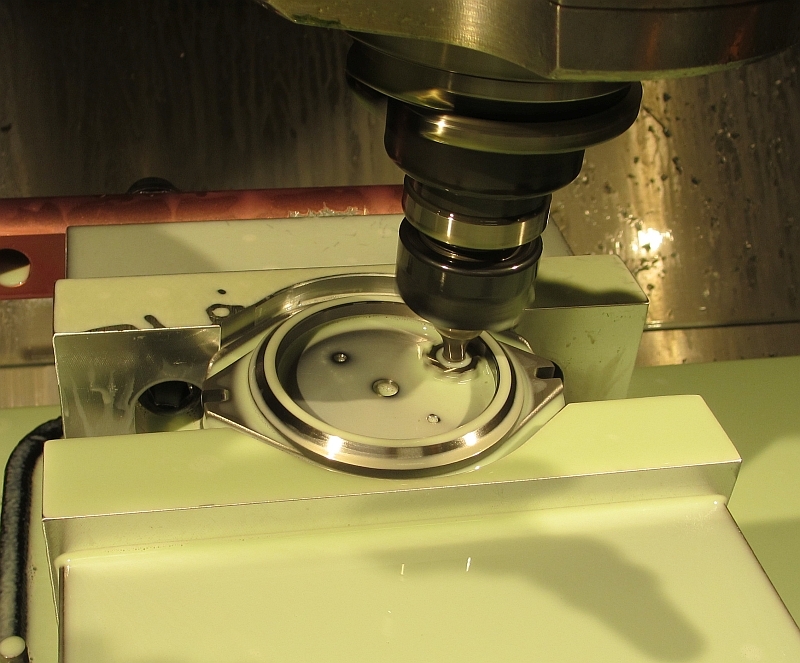 Last operation on the base is to counter bore the screw hole for the thrust bearing. As luck would have it I had the proper counter bore in the drawer but I did send it out to be sharpened. It is nice to have a quality sharpening service nearby. Well that is about it for now; thanks for checking in. Nice looking parts Dave! 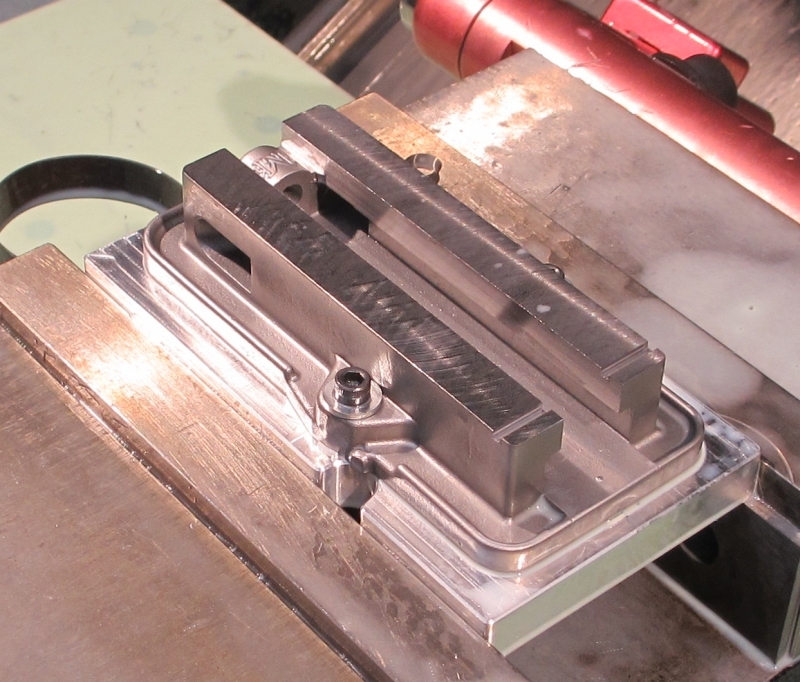 That vise would look awesome on my F1! Side question, will you be posting the pics from the rest of your build of the other vise on that thread? Looking forward to seeing the rest of that one too! Great progress Dave. And beautiful pictures as always!! 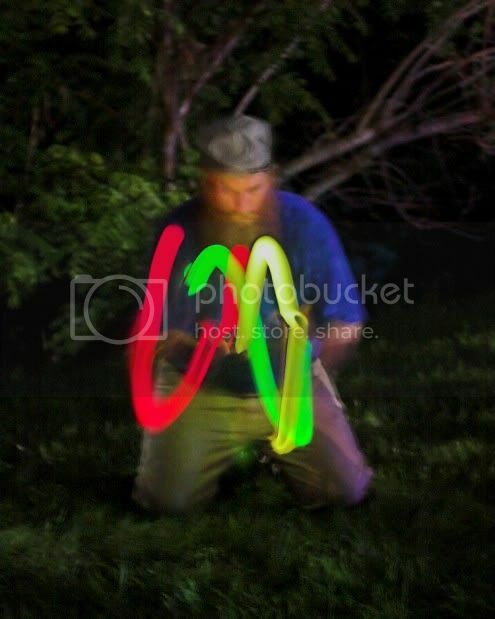 Hi Dave, great pictures of an excellent Job. 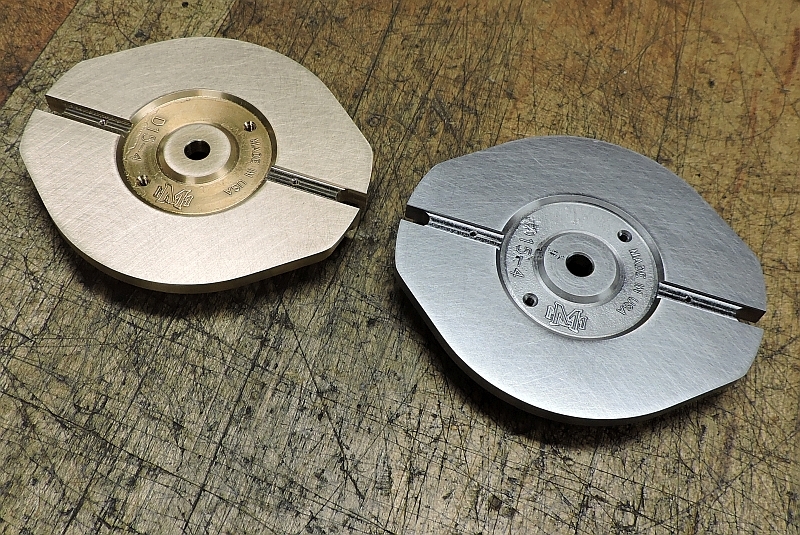 Chris, I will try to get an update on the Model Builders Vise thread posted this week. OK so they have a bronze one and a 4140 one....right? Dave, yes there were some bronze castings, and the others are 4130 cast steel. Roland can clarify but I think that there is not going to be any more Bronze castings available due to the very high cost. There will be the cast steel kits available in the future but at the present time the foundry has a long lead time, I'm not sure when exactly, I'm guessing later this year. Eric, I'm sure LuElla will happy to hear from you! Zee, thanks for stopping by, I appreciate it.